The consistent success of SRI has prompted some progressive farmers and NGOs to experiment SRI principles in other crops like wheat, finger-millet, sugarcane, rapeseed, mustard and few solanaceous vegetables. This publication is an effort to disseminate these innovations and scaling up the methods as a consolidated document of farmers’ practices on SRI methods in other crops. Symptoms and integrated management of a few important disease and insect pests of the crops are also inducted in this document to illustrate a complete package of practices. It is an established fact that SRI has low insect pest and disease incidence resulting in low or nil chemical pesticide application. Most of the SRI farmers are using organic pesticides as preventive measures or when the attack is below the threshold limit. However under changing environmental condition and indiscriminate chemical application to the rice crop in general, the pests have also developed resistance. In such circumstances there is a possibility of disease pest attack to SRI crop in greater proportions than earlier. Therefore, in order to avoid such disease pest attacks and to ensure a healthy crop, the SRI farmers are to be acquainted with various rice pests, damage symptoms caused by them and their chemical and non-chemical management options along with few ITKs that have been proved beneficial against certain disease pests. For advancing local collective action towards up-scaling various technological innovations in the development sector on select innovations undertaken by civil society organizations, rural communities and research agencies from various parts of the country, this document is brought forward to facilitate a mechanism to cross-pollinate and scale-up bright and innovative ideas for subsequent attention of Government, policy makers, research institutions, donor agencies, scientists, academicians and others towards enabling wider replication of such innovations in our country. 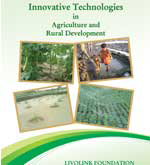 The document is a compilation of initiatives and cited experiences drawn from selected initiatives of NGOs and other agencies on such innovations and constitutes the reflections presented in this publication on Innovative Technologies for Agriculture and Rural Development. Rice is the staple food of India. The country has the largest area under rice (44 million ha) accounting for 29% of the global rice area and is the world’s second largest producer accounts for 20% of world rice production. Although introduction of advance technologies during the green revolution has increased production, simultaneously it has increased the input costs also. A saturation point has now reached and rice productivity has become almost stagnant. Further increase in input cost does not have significant impact on productivity. At this juncture, there arises the need for a low cost and eco-friendly practice which would increase productivity in a sustainable manner. System of Rice Intensification (SRI) is one of the answers to this impending situation. The SRI methodology is the best solution for the problems faced by the poor and marginal farmers of many agrarian states of the country, where rice production has a direct bearing on the farmer’s income. In states like Odisha, Jharkhand, Bihar, Chhattisgarh, West Bengal and Assam, the status of rural economy largely revolves around rice production.